Slots & Sports. The combination works and is great. In the variegated world of legalized gambling games, it is often common to find slot machines that have a graphic theme for sport: from soccer to tennis, including horse racing, fishing and golf. In spite of how apparently it may seem, the modern video slots, as can be seen in the review portal of slot Eslotmachine, have specific features with always different bonus phases to activate and random jackpots to win. A world that must be applied, and increasingly appreciated and clicked thanks to the availability of the machines in both for fun and real cash. Skip it would say the web announced in the late morning! The wifi at the English stadium does not work and the troupe of professionecalcio.net, following the Torres, can not broadcast the live. What will the weather be like on the Serie A championship? 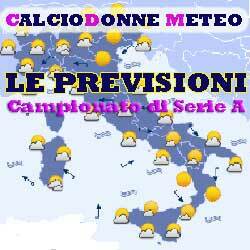 We send you the weather forecast for Saturday 19 January on the fields of the 2 ° day of return of the Serie A championship. The predictions are made by Luca Palumbo - source wetterzentrale.de -. "following agreements between companies, the ACF BRESCIA FEMMINILE - TORRES CALCIO match will be held on Wednesday 28 November 2012. (official field - official time)"
This morning defender Francesca Welter underwent the tests on her right knee injured on Saturday in the match against Napoli. Following the recovery of the athlete the rehabilitation center Fisio & lab where Welter was visited by Dr. Peretti who confirmed the first diagnosis of the medical staff grenade: injury to the anterior cruciate ligament and the medial collateral ligament. I, the undersigned, Luigi Peluso, as president, I am sending you this to denounce a total lack of education and sporting correctness towards the athletes of the GSF Spezia for women's soccer. Against us we are not new, now totally irreverent and unsuitable attitudes from the designated referees. Nicco: "Little bright, well the Ambrosi"
The granata technician analyzes the race against Saluzzo: "The loads were felt, as were the absences." In defense I demand more attention "
Can not be satisfied at the end of the game Eraldo Nicco, despite the team has made progress in the construction of the game, still too few times we see the attacker go to the net and a few days from the official debut in the Italian Cup time to change mentality the girls start being little. A draw for 1-1 that highlighted some defensive errors compared to the game with Cuneo. "Some forced absence was definitely paid, in the field fell girls who in these days have not been able to do all the preparation for some physical ailment and the movements of the department have suffered. Read more: Nicco: "Little bright, well the Ambrosi"
The Torino Calcio Femminile communicates that the operation which this morning has undergone at the Susa Raffaella Barbieri hospital has had a positive outcome. The attacker grenade was operated by Dr. Marini for the injury suffered in July in a tournament in Barcelona in which the meniscus and the left front crusader broke. 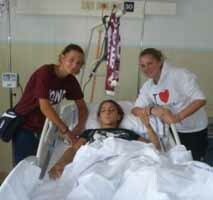 In the morning the player received the visit of her two companions Eusebio and Olivetti. The attacker will begin rehabilitation therapies in the coming days. Coluccio: "It was tough, but I see the end of the tunnel"
The grenade defender is about to complete the rehabilitation after the knee operation: "They told me that if all goes well I would have to rejoin the group for the month of November.There were difficult moments, but I had great people by my side"
This year his will be a very delicate role, although he can not yet be in the field to train with his friends Francesca Coluccio will have to encourage them and guide them from out of view the experience in the highest category gained in past years. Experience that will have to put at the service of the team to help the youngest grow and endure the pressures of the series A. Read more: Coluccio: "It was tough, but I see the end of the tunnel"